Blackpool have been fined £50,000 for the pitch invasion that caused their Championship game against Huddersfield Town in May to be abandoned. The Football Association will also force the club to play a competitive home match behind closed doors if a similar incident occurs next season. The Seasiders have also been "severely warned" about their future conduct. Thousands of fans had protested against the club's owners, the Oystons, outside Bloomfield Road before the game. The game itself was stopped just after half-time when hundreds of fans ran on the field, and it was held up for more than an hour before it was eventually called off. The Football League declared the result 0-0 after it was abandoned with the score goalless. 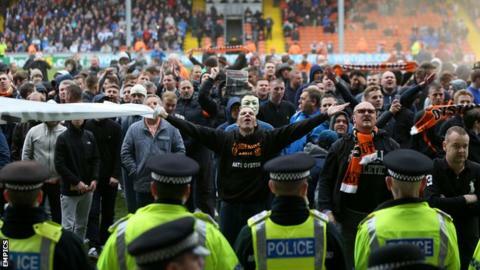 It was the final home game of a miserable season for Blackpool, who ended the campaign with an 18-match winless run as they finished bottom of the Championship and were relegated to League One. More demonstrations by some Blackpool supporters against the Oyston family's running of the club have followed since the end of last season. A friendly against Lancaster City was abandoned because a pitch invasion and a game at Morecambe had to be postponed because of safety concerns. Since then, the Blackpool Supporters' Trust have made a bid to take over the club, an offer that owner Owen Oyston is seeking further information about.